Because the show was still in production with a different cast, the reruns had their name changed to Jeff's Collie. The same thing was done with reruns of Dragnet; they were called Badge 714. Wow! this show brings back memories. I used to watch it when I would get home from school. I think it was called Jeff's Collie back then. 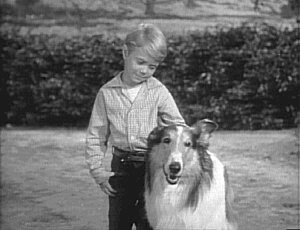 The show with June Lockhart and Jon Provost, I think was called Lassie. Let me know if I'm wrong.